Aspirin and hydrogen peroxide mix... dissolve the non coated aspirin in peroxide and apply to the cold sore blister, this only works if the sore has opened and should dry the blister right up. Bicarbonate of soda .. Mix the bicarbonate of soda with water into a paste and apply to the coldsore, but don't rub it on.. dab it on. Nail Polish Remover .. use an application of acetone based nail polish remover every hour with a Q-tip. Garlic .. Try cutting a clove of garlic in half and rub it on the cold sore blister. Ice .. Apply well-wrapped ice for at least an hour to chill the area, but not long enough to cause pain or frostbite to the area. Milk .. When applied to the cold sore blister it can help to reduce redness and swelling. drinking milk all the time also helps your body's immune system. Ear wax .. Apply to the cold sore blister as soon as you can, weird but some people swear by it it does have anti bacterial properties. Tea bags .. Apply a teabag to the blister the tannic acid dries and heals the sore. try freezing or cooling the teabag then apply the cold teabag to the swelling blister the cold also helps to stop the swelling on the other hand some people swear by putting a warm teabag on the blister. Calamine lotion .. Apply at regular intervals during the day. Rubbing alcohol .. Applied to the cold sore blister will dry it out fast. This list will be updated on a regular basis as we hear of new home cold sore remedies so check back regularly. Try all or some of these in different combinations they will help your cold sore blisters no end. 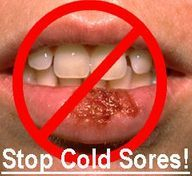 Now research is following a new strategy in the fight against cold sores the whole emphasis is not trying to heal your cold sore blisters when you get a break out but helping your body trap the virus in the cellular structure of the nerve so stopping any further outbreaks, the reasoning behind it is to keep the virus dormant before it ever gets a chance to replicate again thus keeping you free from the virus for life. In other words .. Prevention is better than cure. Healthy Body = No Cold Sores!